ethics; therefore everybody of United National Party condemns such action. 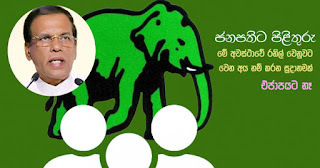 He further informed that they will not be going for other options other than go for the procedures that existed prior to October 26th and that UNP has no other desire in this connection. He also mentioned that everybody of United National Front have arrived at a unanimous decision in this respect. The general secretary also stated that Mr. Ranil Wickramasingha has to be installed in the position of prime minister and that there will not be a change effected for necessity of another party. Finally he said that protests would be launched in forthcoming days to develop 'jana balaya' against government. A special discussion was held by United National Front presided by leader of Uited National Party Mr. Ranil Wickremasingha last evening itself and the discussion lasted for close upon 2 hours at Temple Trees, other parties representing United National Front too present in which instance several collective decisions were arrived at. In the meantime, what Mr. Rajitha Senaratna had said was that the UNP would be forming an alliance with the SLFP. As a result of actions taken by Maithripala Sirisena, the SLFP has been handed over to 'Pohottuwa' and that in order to protect SLFP the party group drifting away from them would be uniting with them on behalf of SLFP.